Imagine leaving the house each morning for work with a healthy and delicious lunch in tow - no morning prep required! 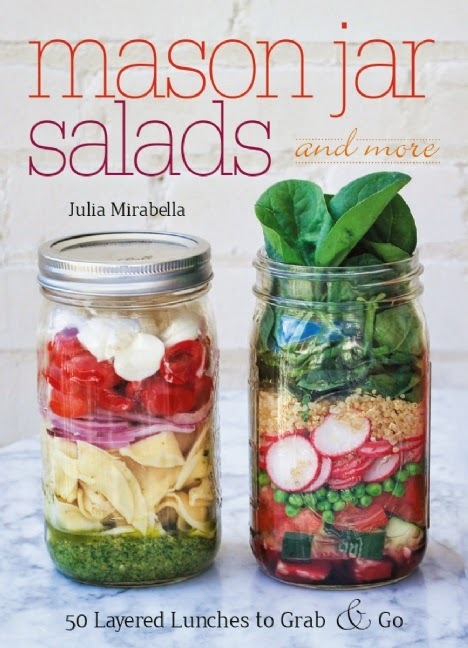 Introducing Mason Jar Salads and More, a new cookbook that will show you how to create fun and easy layered lunches, snacks and more. This book will inspire endless on-the-go meal possibilities with its 50 recipes and full-color photos. Thanks to the glorious mason jar and smart layering techniques (dressing on the bottom! ), you can make delicious dishes ahead of time and spend no more than 30 seconds grabbing them from the fridge on your way out the door. By spending a little time on the weekend making mason jar meals for the coming week, you can save time and be out the door quickly with a delicious lunch in-hand. The book starts out with an introduction and lets you know what supplies you will need. There are step-by-step instructions with photos explaining the concept on how to layer in your ingredients. The author also explains why mason jars are used. Then you move on to the recipes which include breakfast, salads, lunch ideas, snacks & dips and salad dressings...all at your finger tips. The above is just a sampling of the delicious recipes you will find in this fabulous cookbook! Hubby and I are loving this book! We spend about 30 minutes on a Sunday preparing our lunches for the week. All prep steps are easy and many ingredients can be used in various recipes. In other words, a head of lettuce can be used in multiple recipes. We also like that they are made in mason jars instead of plastic containers. We bring them home from work, rinse them out and pop them into the dishwasher for cleaning. Plus, they don't take up much room in your refrigerator at all and you can clearly see what is inside each mason jar. Just fabulous! Brightly colored and with a satisfying crunch, green beans don’t need much to improve them — as long as you don’t overcook them! Steam or boil your green beans to get maximum flavor out of them. Trim the ends from the green beans; cut the beans in half crosswise. Bring a pot of water to a boil over high heat (don’t salt the water), add the beans, and boil for 5 minutes. Transfer the beans to an ice-water bath for a minute to stop the cooking process and preserve their color. Drain. 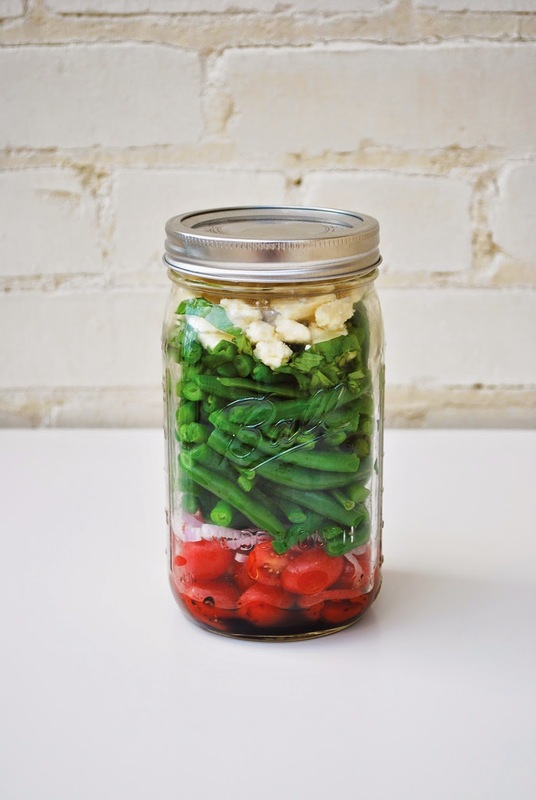 When the green beans have cooled, layer the salad ingredients in the Mason jar, beginning with the vinaigrette and continuing with the tomatoes, shallots, cooked beans, basil leaves, and feta cheese. Seal and refrigerate until ready to use. About the Author: Julia Mirabella grew up in a household that emphasized Italian food and taught her to love cooking with fresh ingredients. When starting her first job as an attorney, she realized she needed to rethink her work lunches & started making mason jar salads as a way to eat better. You can follow her blog at www.myfoodandotherstuff.com. She lives in Washington D.C.